Gone are the days of boring old beige – beige has reached new heights in the last few years as homeowners have embraced the versatility of what was once considered a basic ‘builders’ colour. Barcelona Beige is a soft, slightly warm beige with a light/medium depth (LRV 47). Overall it’s one of the most neutral beige colours as it isn’t overly warm, but it also isn’t grayed-out. Read more: Don’t Choose a Paint Colour Without THIS NUMBER (LRV)! Kilim Beige is warmer than many beige paint colours without fully committing to yellow, orange or pink. It leans slightly more to the brown/orange end of things, not the yellow end, without becoming obnoxiously peach-toned. Compare it to Macadamia to see the difference. Being the light/medium version of Kilim Beige, Nomadic Desert as the same look, just on a slightly deeper level. It’s on the warmer end of the beige scale with a blend of undertones that lean just a wee bit more orange than yellow, but not by much. When thinking of ‘beige’, Nomadic Desert is likely a little bit darker than the average person traditionally thinks of, but isn’t so heavy that it will weigh down a space. There’s a wink of red in there, but not enough to make things go pinkish. CLICK on the above images to see available packages! Accessible Beige is a gorgeous beige that has a soft and subtle taupe base to it. It really is a lovely blend of beige and gray, leaning more to the beige end of things. (Accessible Beige is the lighter version of Balanced Beige). Canvas Tan is a LOVELY beige paint colour. Canvas Tan is soft, fresh and bright and has considerably less warmth in it than the colours above – making it feel more ‘neutral and tan’. However, it’s not so neutral that it borders on becoming a ‘greige’. Compare it to Accessible Beige and see a shift in ‘freshness’. Wool Skein is one of the nicest beige paint colours on this page (and my fave – because really, it’s all about me…). It is light and fresh without becoming tooo light. It is a warm neutral, and leans more to the yellow side than any of the colours above WITHOUT being obnoxious about it – in fact, compare it to Canvas Tan to see the shift from a beige that is neutral (Canvas) and a beige that is similar, but slightly warmer (Wool Skein). It can also pick up a vague (really vague) green undertone, but nothing to worry about at all. I hope you’ve enjoyed this post on the best beige’s, thanks for visiting! Want a beige that’s custom tailored to your personal tastes? Check out my E-Design / Color Consulting and Decorating Services! Kylie M Interiors Interior Decorating and Design Ideas. Virtual or Online Color Consulting Services and E-design. Based in Nanaimo BC and serving Vancouver Island and the whole darned World! This is a very helpful format. I like to know the undertones in colors and also woods, ect. that they work well with. Very well done. I love Wool Skein, it is a “clean” looking color. It creates a wonderful neutral backdrop that can be accented with almost any colors. It works well with my tile backsplash that has tones of espresso and gray as well. Would you happen to know the trim color in the pictures of Wool Skein? Would you use Accessible Beige or Agreeable Gray with Cherry Wood floors and cabinets? Hi Jackie, I would probably lean toward Agreeable Gray with cherry wood, rather than Accessible Beige. Both would look good, but I think Agreeable would be a bit nicer…. Thank you so much Kylie! You were so right about Revere Pewter. My rooms are North and South facing…and it turned cold and muddy in the North facing. It also made my Cherry Cabinets look bad. I love Agreeable Gray as well…still so concerned about it looking “cold”. Is your go to color with North and SOuth facing going to be warmer like the beige and tans since it’s all Red wood? Any advice for a small south facing living room that has black shabby chic furniture? Every ‘”tan” I’ve tried ends up looking too dark. I have wool skein throughout my home (main entryway, hallways) and agree 100% with your statements about it. Great article, thank you! Your thoughts on SW Nantucket Dune? I like it but never hear it being recommended. I am using SW wool skein in my kitchen. White cabinets, dark wood floor. I want to paint the ceiling a light blue, I just don’t know the best one? Hi Cathy, thank you for the note! Due to the amount of personal questions I get in a day, I do need to refer you to my Online Consulting – sounds like your needs would fit well into the ‘Feature Wall’ package! I think I have read this particular post at least 5 times and found it again when I was researching a neutral color for my basement (it only has tiny windows). We are in the midst of installing new carpet ($3K..more than I want to spend but it is 26 years old) and I wanted to update the colors to more neutral and less 1990’s (currently 2 walls are yellow/gold, 2 walls are brick orange, and 2 are a brighter shade of orange. The trim is a medium brown toned oak. I think after spending countless hours and rereading your post, I will choose Wool Skein as I want a lighter brighter look that is more light reflective. I do want to keep the big accent wall that is in view when you walk down the basement stairs and also holds the large screen TV. I was thinking a dark indigo color but now I am leaning towards a terra-cotta color to coordinate with our big comfy brown sectional. I’d love new furniture but budget will not allow a change. Any opinions or advice? I LOVE your blog and think you have really had some great posts lately…keep up the informative posts!! Hi Susan, thank you for the note – and good timing – you caught me just as I was catching up on my dozens of comments. Usually I refer things to my Online Consulting. But I can say that from the sounds of it, you might want to stay with those warmer tones (like the terra cotta/Wool Skein) and then accent with the dark indigo – it might better suit a basement with tiny windows as it will be cozier that way! For a north facing room, would canvas tan or wool skein be better suited, without making the room dark, dull, or too cool. Also, can wool skein match well with some of the colors you mentioned on the canvas tan video such as agreeable gray and sea salt, or is it too warm? Hi Tricia, I might lean a bit more toward Wool Skein, knowing that the north facing light ‘might’ enhance the weee wink of green that is actually hiding in there (not a bad thing, but something to know anyway). And yes, Wool Skein is pretty darned versatile so you’ll find it coordinates with those colours nicely in a palette! I love your vids. I need help choosing two additional colors for our flip properties. We typically work with Repose Gray in all the common areas and then switch things up in the bedrooms with Sea Salt (green) and Krypton (blue). Both are stunning colors that work well transitioning from the gray hallways. I need two more neutral SW colors for our rehab homes that have 3-4 bedrooms. 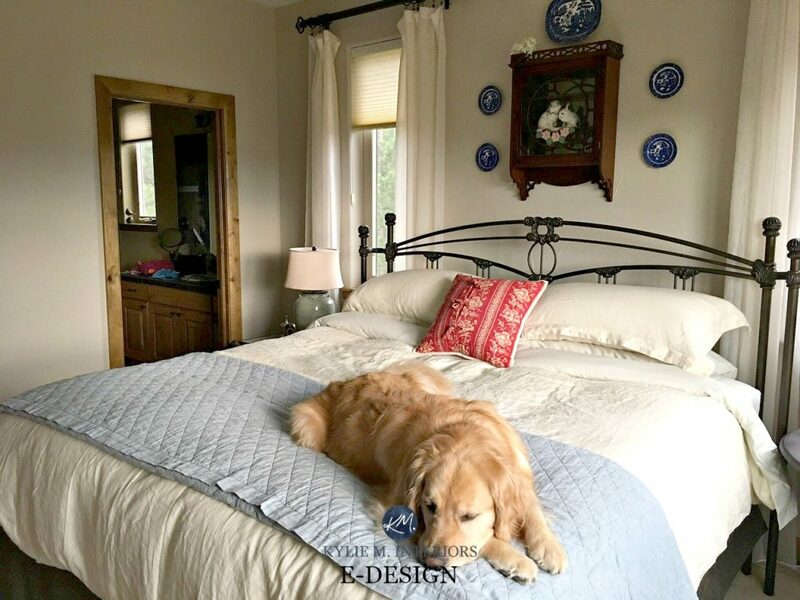 We like to paint each bedroom a different color because it shows better in listing photos and identifies each room as separate. So……can you recommend a pale yellow and a beige/tan that would blend well with the other colors? Thank you for this post! Quick question, I am painting my walls SW balanced beige, and was wondering if you thought wool skein could work as the kitchen cabinet color against this? If not, do you have recommendations for a color that will work well on the cabinets? Also, when you say 25% lighter in your video for accessible beige do you mean mixing 3 parts AB and 1 part white? My Sherwin Williams rep suggested accessible beige for my living room kitchen area as I have dark brown furniture and sliding blinds and cherry kitchen cabinets , but Inthink it’s too drab. I want a light color with a tan/gray undertone but not sure if this is too light. thank you. Will lightening accessible beige change the LRV? My entire home is SW urban putty. Trying to lighten things up. Hi! Thanks for the pictures- we purchased a house that needs repainted to lighten the rooms- the baseboard trim is a dark wood so I was wondering if you think the Accesible Beige would go ok with darker trim? This article is so helpful! I can’t decide between canvas tan and wool skein. We have dark, cherry wood trim in our living room, and it does not get much light. We want a neutral, warm color. Hi again! I have another questions that you can hopefully help me with. My kitchen and dinning room face west so I tried using Wool Skein, however, I must be the rarity because it came out so darn yellow. Would canvas tan work better? Hi Sarah! Wool Skein is tricky as it has those warm tones in it, but it can also pick up a wink o’ green! Yes, you might find Canvas Tan a bit better or even Natural Tan. That’s without seeing your home/finishing, but its at least a place to start! I have Canvas Tan walls with stained oak cabinets and trim in my utility bathroom, and it looks great. I also painted Canvas Tan in a long bedroom hallway that receives minimal natural light. The hallway trim has 13 year old white oil-based paint that has yellowed considerably through the years and looks awful with the walls. I need to re-paint all the trim– which Sherwin Williams white do you suggest to pair with Canvas Tan (and Softer Tan because that’s what’s painted in other areas of my home)? Thank you. What would be the best accent wall color for canvas tan in a Den? I have SW Navajo white woodwork (and a lot of it). I am looking for a neutral for the entry and main living area. The color sample of Wool Skein definitely changes every time I walk by and look at it . Would you put Wool Skein with SW Navajo white trim? The main window wall is west facing. Hi Evonne! Wool Skein can pick up a slight green undertone (very slight) and I might worry about that a bit with Navajo White. You may need to warm things up a bit! Thanks Kylie- I have learned a lot from your site. I see that green undertone in some light. What would be a warm option? do you have anything written about white paint colors???? I only have east facing windows in a condo–plantation shutters cut some light–i have stark white cabinets i inherited from previous owner–she liked cool colors–how do i warm this up with a white??? Hi Dee, you bet I do! If you go into the search area, which is in the right hand sidebar, and type in ‘white paint colours’ you’ll see that I have 3-4 blog posts about whites! We’re building a home that has a large open concept great room with large windows on the South side. I’ve been leaning towards having it painted in the Wool Skein. I’ve tried the color and like it a lot on the sample board. I’m looking for a color that will coordinate well for a feature wall, (The wall with the large windows and fireplace) And I’ve been looking for a color that doesn’t pull as much of the green undertone, but more of a brown warm color. Do you think Accessible Beige would work well with Wool Skein? Your website has been great and I keep referring back to it. Hi Carrie, I do try to refer most personal questions to my E-design, so I can spend some time with things, but I wouldn’t pair Accessible and Wool Skein – too similar, but different. I would also think twice about Wool Skein as it is lovely, but CAN pull a wee wink o’ green! Thanks so much for taking the time to answering my question. 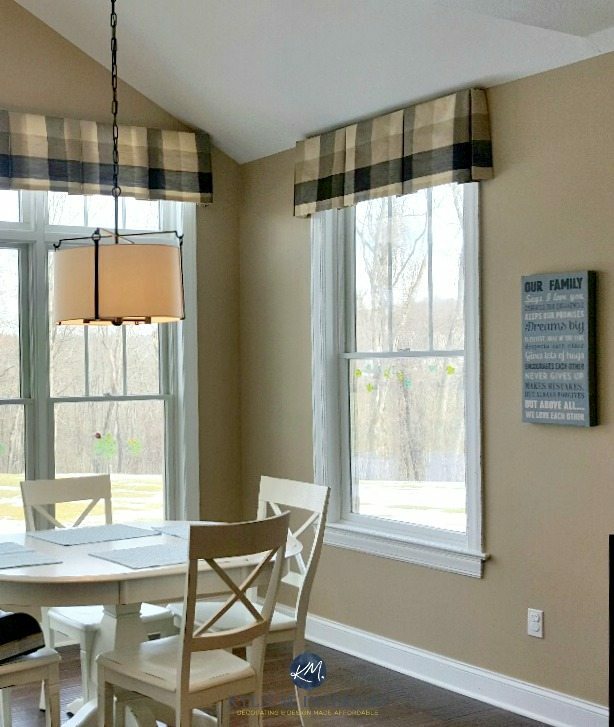 What’s another Sherwin Williams color similar to Wool Skein that would look good throughout most of the home? I’ve also looked at Grecian Ivory and like it. I am so confused on color. I have oak cabinets with yellow undertones. Medium honey color. The Sherwin willams paint specialist I had come to my house picked Modern Gray. I don’t think gray tone is good in my 1960’s traditional house. Where should I go from here. I have wood floors, face south so no direct sunlight. I am redecorating my bedroom and deciding between worldy gray and accessible beige. My bedroom faces east and I do not get a lot of natural light. Which color do you think would be better and what undertones are they known to have or do you have any other neutral color suggestions? I’m actually lightning my open floor concept a little and I have north and south light coming in from both sides. My kitchen cabinets are white and my counter top is a light grey , my tile has a little bit of cream and beige. I was looking into accessible beige and modern gray. I really don’t want that cold feeling ,but ; I don’t want the yellow gold tone from accessible beige.. I’m looking for the cozy look with a bright feeling ..if that makes sense.. thank you! Thank you so much for your articles. I have never heard of LRV before you posted about it. We just picked out Neutral Ground for our new home … it has not been painted yet, and I was wondering if you knew the LRV for that color. Thank you!! Hi Janet! The LRV for Neutral Ground is 70, and I am a HUGE fan of Neutral Ground! Thanks for all the helpful info you have provided! I love the look of SW Wool Skein in the picture above. On the wall in my north and east facing bathroom, it looks more yellow and loses that bit of gray feel to it. Perhaps it is the lighting and shades on the scones. What color would be very similar to SW Wool Skein, but with less yellow and more of a gray undertone/feel. I am painting my kitchen walls and cabinets. The colors need to coordinate with dark emparodor marble. Floors are ivory. I was thinking of painting the walls accessible beige and the cabinets balanced beige. Trim is white and room is south facing. Would this work? I have spent hours looking at SW paint colors. It’s exhausting. Great article! I have the honey oak trim and hard wood floors and I’m going between agreeable grey and accessible beige. Which do you reccomend with honey oak? Thanks! Hi Cinty! I do lean a BIT more into Accessible Beige than Agreeable Gray as the warmth could sit just a bit better, however it can depend on exposure/furnishings and other things too! I love Kilim Beige and this article really helped me make the. Decision. I’ve subscribed to you! That’s what I love to hear, thank you Deb! I am in the process of picking out paint for my great room which has a high valued ceiling. It is south facing. I like SW Nomadic Desert for the walls and SW Dover White for the trim. There is no trim at ceiling. Only at the floor, and around windows and doors. Should I paint the ceiling Dover White or consider SW Divine White or another color to make the room feel more cozy and not so lofty.? accessible beige not grey sorry.